Whether you’ve a leisurely or an active lifestyle, sports shoes are more comfortable and enjoyable to wear with a pair of these softly combed, cotton rich Elle Sport Cushioned No-Show Socks – so just as well that it's a twin pack of co-ordinating colour mixes! Elle Sport Cushioned No-Show Socks sit just under the anklebone and hidden from view in most trainers and plimsolls. 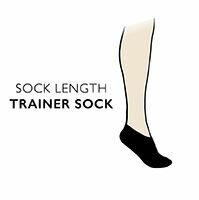 The half cushioned design, protecting the toes, soles and heels, including hand linked toes for smooth seams and arch support bands, help these socks to be easy on the feet, even during strenuous exercise and reduce abrasions and shocks.